NORTH KINGSTOWN, R.I. — With 3 hours and 44 minutes to spare, Wilson’s of Wickford reached its crowdfunding goal and will stay in business. The store, which owners said would have to close in August if it didn’t raise $148,000 by Monday at 9:55 p.m., reached its goal on the crowdfunding site crowdtilt at about 6:15 p.m.
“Whoo,” breathed James Wilson, one of the owners and a grandson of the man who founded the store 70 years ago. As the total grew closer to the goal, he said, he started making calls to people who were standing by in case emergency action was needed, to tell them they could relax. “It kind of happened while I was making those phone calls,” he said. Crowdtilt, which collects pledges online until the goal, or “tilt,” is reached, showed that the donor who put the campaign over its goal was Don Tefft. “That’s my cousin,” Wilson said. Tefft was the one who had introduced him to the concept of crowdfunding by sending him a link five weeks ago, Wilson said. Wilson researched companies and chose crowdtilt for the store’s campaign. He called his cousin Monday evening to thank him for the suggestion. “He had almost forgotten he had sent it,” said Wilson, who was eager to get busy restocking the store. Alice Coachman, who became the first black woman to win an Olympic gold medal when she captured the high jump for the United States at the 1948 London Games, died on Monday, July 14, 2014, in Albany, Ga. She was 90. Her daughter, Evelyn Jones, said she had been treated at a nursing home for a stroke in recent months and went into cardiac arrest after being transferred to a hospital on Monday with breathing difficulties. Coachman (who was later known as Alice Coachman Davis) received her medal from King George VI. She was invited aboard a British Royal yacht, she was congratulated by President Harry S. Truman at the White House, and Count Basie gave a party for her. She was lauded in a motorcade that wound its way through Georgia from Atlanta to her hometown, Albany. But she had returned to a segregated South. Blacks and whites were seated separately in the Albany city auditorium when she was honored there. The mayor sat on the stage with her but would not shake her hand, and she had to leave by a side door. As a youngster in Albany, she had run and jumped barefoot, using ropes and sticks for makeshift high jumps. She had not been allowed to train at athletic fields with whites. At a time when there were few high-profile black athletes beyond Jackie Robinson and Joe Louis, Coachman became a pioneer. She led the way for female African-American Olympic track stars like Wilma Rudolph, Evelyn Ashford, Florence Griffith Joyner and Jackie Joyner-Kersee. Alice Marie Coachman, one of 10 children, was born in Albany on Nov. 9, 1923, to Fred and Evelyn Coachman. She ran track and played baseball and softball with the boys when she was young, but her father, a plasterer, was angered by her refusal to be ladylike and sometimes whipped her for pursuing athletics. She saw little prospect of an athletic career and thought of becoming a musician or a dancer, having been enthralled by the saxophonist Coleman Hawkins and by Shirley Temple. But she was encouraged by a fifth-grade teacher and an aunt to continue in sports, and she came to the attention of the Tuskegee Institute in Alabama while competing for her high school track and field team in Albany. Coachman moved to Tuskegee and competed for the institute’s high school and college teams and later for Albany State College (now Albany State University). She captured the Amateur Athletic Union high jump championship 10 consecutive times, from 1939 to 1948, and the union’s 50-meter outdoor title from 1943 to 1947. She also won national championships in the 100-meter dash and the 4×100-meter relay. But Coachman had to wait until 1948 to compete in the Olympics; the 1940 and 1944 Games were canceled because of World War II. On a rainy afternoon at Wembley Stadium in London in August 1948, she vied for gold in the high jump with Dorothy Tyler of Britain. They both cleared 5 feet 6 1/8 inches, but Coachman won because she did it on her first try. Micheline Ostermeyer of France was third. Coachman, the only American woman to win gold in track and field at the London Games, remembered the moment long afterward. 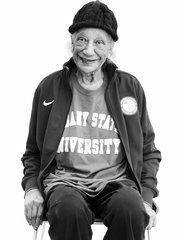 Coachman’s track and field career ended with the 1948 Olympics, when she was 24. She raised a family, became an elementary and high school teacher, and created the Alice Coachman Track and Field Foundation to aid young athletes and former competitors in financial need. She is survived by her daughter and a son, Richmond, from her first marriage, to N. F. Davis, which ended in divorce; a sister, Dicena Rambo; one grandchild; and two great-grandchildren. Her second husband, Frank Davis, died about five years ago, her daughter said. Coachman was inducted into the United States Olympic Hall of Fame and the National Track and Field Hall of Fame. There is an Alice Coachman Elementary School in Albany. Coachman faded from public view after the 1948 Olympics, but her pride remained undiminished.